These back lacing Stays of heavy leather with stomacher front are constructed from 3 main pieces joined by Streatley stitching*. The front section of the stays is very wide at the top featuring a square neckline and tapers down at the waist. 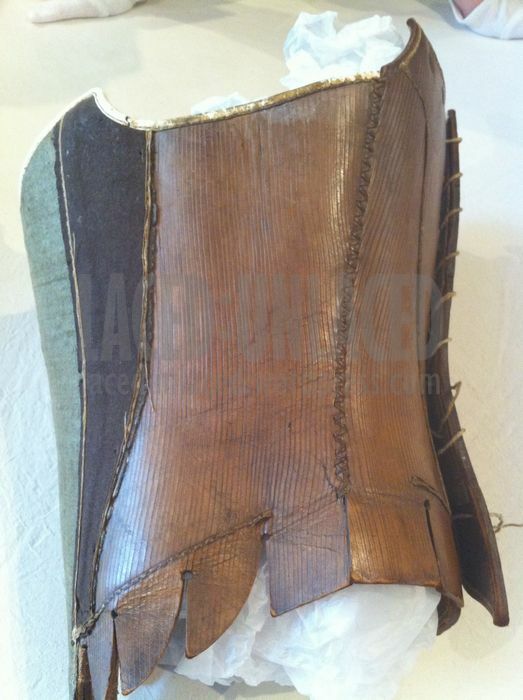 The leather at the front is covered with green fustian* and bordered by panels of brown wool. The top edges are covered with linen tape. The stays have 10 pairs of stamped and pressed eyelet holes impersonating hand worked eyelets. Scoring on the leather is used to represent stitching down the centre back. 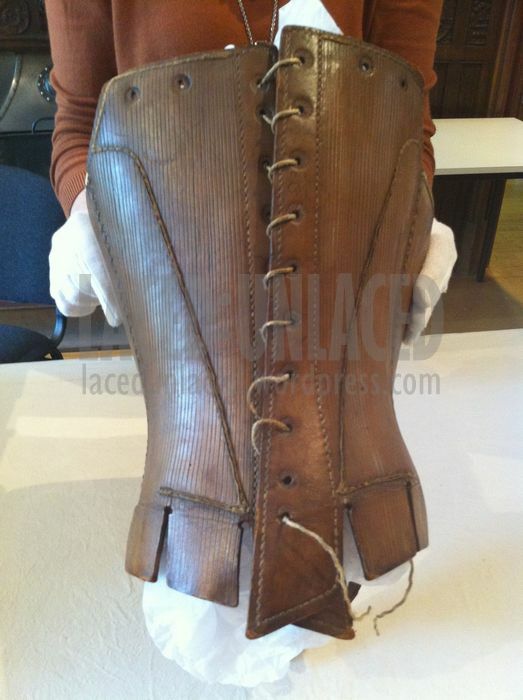 There are eyelet holes along the upper edge so that shoulder straps could be attached. Tabs at the lower edge would splay out over skirts. The term Fustian is derived from Al-Fusṭāṭ, suburb of Cairo in Ad 200, where textiles were manufactured. It eventually spread to Europe where there were guilds of fustain weavers by the 13th Century. According to Wilhelmsen, fustian is the oldest cotton fabric mentioned in English. Fustian belongs to a wide group of fabrics that are characterized by their piled surface including moleskin, velveteen and corduroy. Fustain is also a subset within that group of fabrics in which the pile is produced by weaving two sets of cotton wefts or fillings, on a linen warp. Streatley stitch used to join the stays panels is typically classed as a Glover's stitch and can be described as being a combination of a backstitch and overcast stitch butting two pieces together. 'It is made by passing the needle twice through the same hole'. The thread must be kept behind the needle (right hand side) at the second stitch. it makes the horizontal stitch and then the diagonal as it passes the thread on to the next horizontal. (Edwards) The stitch has a characteristic pattern of Z shapes on one side and x shapes on the other.